Report, 1983, Dial a Scientist launches a New Book [illustrated feature], South Wales Echo, ?15 June. Anon, 1983, 101 Questions About Science, Summer Catalogue: 20, Hamish Hamilton, July. 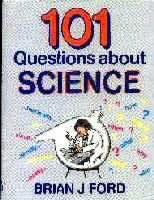 BJF, 1983, 101 Questions about Science, 90pp, ISBN 0-241-10992-2, £6.95, London: Hamish Hamilton, September. Taylor, B., 1983, 101 Questions about Science [in] Good Book Guide, PO Box 400, London SW8 4AV, September. Anon, 1983, One for the Road [review of 101 Questions], Womans Journal, September. Knight, Sam, 1983, Review of 101 Questions about Science, Western Mail, 6 September. Clapperton, Bill, 1983, Now the Secrets of the Universe are All Mine! [review of 101 Questions about Science] Evening News, Edinburgh, 10 September. Anon, 1983, Review of 101 Questions about Science, South Wales Echo, ? September. Anon, 1983, All the Answers, [Review of 101 Questions about Science], Oxford Times, ? September. 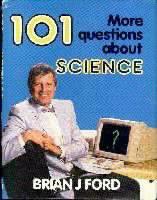 Announcement, 1983, 101 Questions about Science [in] World Book Club Catalogue, Autumn issue. Script, 1984, BJF guest appearance discussing 101 QUESTIONS books, 'Elinor' chat show, HTV [VTR 19 June, TX 22 June]. BJF, 1984, 101 More Questions About Science, illustrated by Brian Bagnall, 90pp, ISBN 0-241-11246-X, £5.95, London: Hamish Hamilton, July. Anon, 1984, Answers to Some of Lifes Oddities [in 101 More Questions about Science], Daily Mail, Hull, 24 August. Applewhite, Rodney, 1984, Childrens Books [review of 101 More Questions about Science], Evening News, Manchester, 30 August. Anon, 1984, Childrens and Adults Questions Answered, review of 101 More Questions about Science, Yorkshire Post, 8 November. BJF, 1993, 202 Questions About Science [computerised edition of 101 Questions About Science and 101 More Questions About Science, q.v.] London: Bookondisk, August. 101 MORE QUESTIONS ABOUT SCIENCE web page.